Samhain (SÙ-un), (or SOW-en), known in Modern Irish as L· Samhna (Laa SÙu-Nu), in Welsh as Nos Galan Gaeaf (that is the night of the Winter Calends), in Manx as Laa Houney (Hollantide Day), Sauin or Souney; is, of course, the eve of “All Saint’s Day”, All Hallow’s Evening or Halloween. Among other things, it is the beginning of the Winter Half of the Year (the seasons of Geimredh & Earrach) and is known as ”the Day Between Years.” The day before Samhain is the last day of the old year and the day after Samhain is the first day of the new year (though for clarity’s sake, most New Reformed Druids assign each Samhain to the year following it. Being a day “between years,” it is considered a very magical night, when the dead walk among the living and the veils between past, present and future may be lifted in prophecy and divination. As the Celtic New Year, it is the time when the veil separating the worlds of men and of the Tuetha de Dannan is at its thinnest, allowing the spirits of the dead, the faery folk, devas, etc., to pass back and forth with little effort. In Scotland, people would place stones or nuts in the ashes of the hearth before going to bed Samhain night. Anyone whose stone had been disturbed during the night was said to be destined to die during the coming year. On Crete, each family prepares a pot of porridge (made by boiling wheatberries, pomegranate seed, raisins, currants and almonds) and then carries it from house to house throughout the village. At each home, a little of their porridge is taken out and added to the household's pot and a little of that household's porridge is added to theirs. By the end of the day, each family takes home a nearly identical mixture of the village's porridge to honour all the departed. In Sicily, this day is called the Festival of the Dead and it is an important celebration, especially for the children, as their dead relatives return to leave them traditional candies and cakes as well as toys. In Latin America, families celebrate the Day of the Dead by visiting cemeteries and cleaning the graves of their relatives. They also honor the memory of departed loved ones by leaving them flowers and by baking traditional cakes and pastries. In Finland, the celebrations we associate with Samhain actually occur around Easter. There are however many aspects to this complex deity. His role as Lord of death is a crucial part of the sacred cycle. concern over the fate of the earth. Lord of the Tylwyth Teg [Welsh Faeries]. follow him into another place. at the member's price (of course, you must be a member to get it at that price). The "official" OMS Bibleography continues to grow. If you haven't checked it out lately, please do. Sybok has put a lot of hours into this effort. The bibliography is now up 90% and functioning. Sybok is still working on the "miscellaneous" page, but should have that up within the week. Then he will be going back and adding in all the suggested works that have been coming in (thanks to those who have contributed). The bibliography is very much an ongoing work in progress, so be sure to check it from time to time for updates. One of the things about it is that it functions as a "suggested reading list" but it also reveals something of the character of the Order, in much the same way that perusing a new friends book shelf will reveal something of their character. About 99% of the books have links either to our own Avalon Risen sale site, or to Amazon.com, where you can purchase the item. The only ones that don't are those we couldn't find and are out of print. Do feel free to make suggestions. And if you have a review of any work therein, please submit it and we'll give you the credit. Also, you have to know we didn't -- we couldn't -- read every book in the list. If you believe or are aware of a book that shouldn't be on the list, for whatever reason, please let us know (and tell us why). Likewise, if we've left something out, or "misplaced" a book (maybe it's in the wrong catagory?). The Cailleach (KAL-y-ach) is the Ancient Earth herself. She is the lichen-covered rocks and the mountain peaks. She is the bare earth covered with snow and frost. She is the Deep Ancestress, veiled by the passage of time. At Hallowmas, Brighid withdraws her green mantle from the Earth. With a last stunning flourish of colour, her power withdraws into the ground. The very soil now holds all of Life. Plants have deposited their seeds there, to wait for the return of the Light. Trees now only live in their roots, leaving their branches bare to the keen winds. Animals as small as insects and as large as bears go into the Earth to sleep the Winter away. The wet of the Winter rains helps last year's plants to transform into fertile soil for the next season of growth. The Cailleach is the Goddess who oversees this transformation. She is the one who watches over the culling of old growth. She is the Death Goddess, who lets die what is no longer needed. But in the debris of the passing year, she also finds the gems, the seeds for the next season. She is the guardian of the seed, the keeper of the essential life force. She holds the very essence of power. This is the hag of winter, often described as an ugly giantess leaping from mountaintop to mountaintop. The rocks she drops from her apron become hills. She has a blue-black face with only one eye in the centre of her forehead. Her teeth are red and her hair is matted brushwood covered with frost. She wears grey clothes and a great plaid is wrapped around her shoulders. When the Winter storms rage through the hills, people say the Cailleach is tramping her blankets. She washes her plaid in the eddies of the Corryvreckin off the Scottish coast, and the next day the hills are white with snow. It is clear that the Cailleach is one with the land, clothed in snow in winter, with brushwood growing on her body. Her one eye shows that she sees beyond dualities to the ultimate unity of all things on the Web of Life. Her appearance alone makes her awesome to encounter. It is hard to relate to someone that ugly. Whenever people encounter her in meditation, they usually feel fear and awe, because she is clearly very powerful. She is the essential power of the Earth, and she has made it clear to me that she will continue to punish our disrespect for her with flood and other natural disaster. This is not a lady to be trifled with. In Celtic myth and legend, the hag is often equated with the Sovereignty of the land. The spirit of the land traditionally held the sovereign power, and any king only held office by symbolic marriage to the spirit of the land. The story of Niall makes this very clear. Women who identity with this Goddess find that she gives them Sovereignty in their lives - a special kind of power and confidence. The Cailleach, fierce though she may be, lives in all of us. She gives us the wisdom to let go of what is no longer needed, and keeps the seeds of what is yet to come. She stands at the cusp of Death and Life. Of course, the Cailleach’s best known guise is that of the winter goddess, representing cold, darkness and death. In the winter months she rides through the air on the back of a wolf (the Gaelic word for January is Faoilleach, “wolf month”), bringing freezing cold, blizzards and ice. Highland tradition says that she has a magic wand which she uses to strike down the tiniest signs of spring growth — she acts as destroyer, bringing the frost that kills the first shoots of plants, the early lambs. Many sources say that her reign ends on April 25, now a Christian festival to celebrate the Annunciation, centuries ago - Là na Caillich, Cailleach Day, the beginning of spring in Scotland. Others say she remains active until Beltane, and that the varying winter conditions in April represent her last fight against the arrival of spring. Some stories tell of the Cailleach’s son who represents spring and who, in order to defeat winter, has to free a young girl held prisoner by his mother. The Cailleach escapes his fatal blow by becoming part of the landscape, turning into a rock or boulder (there’s a Cailleach Mountain in the Cuillins on the Isle of Skye, for example — one of her haunts). The next aspect of the Cailleach is closely related to the above. She is also a weather goddess, a goddess of storms. The west coast of Scotland is her favourite haunt. 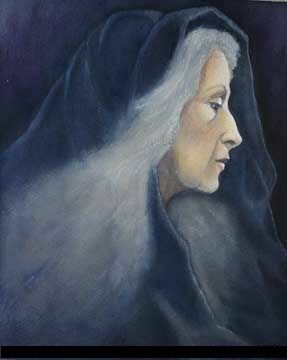 In her guise as storm goddess she is usually known as Cailleach Bheur. Bheur means sharp and can apply to wind and weather as well as a person. The one place that is mentioned most frequently in connection with Cailleach Bheur is the whirlpool of Corryvreckan, just north of Jura. It is one of the spots most feared by sailors as its power can change very suddenly. West coast lore has it that the whirlpool is Cailleach Bheur’s washtub. In winter, she is said to wash her plaid, representing the whole of Scotland. When she has finished, the plaid is white and Scotland is covered in snow. At other times of the year, sailors need to look and listen. Are there little wavelets on whirlpool, foam gushing? Cailleach Bheur is treading her laundry. Is there a noise like thunder? It’s the Cailleach’s sneeze! Both are sure signs that it would be very dangerous to go near the whirlpool. Further inland, the Cailleach can control tidal lochs, causing storms so violent that boats can’t leave harbour. This could have had serious consequences in the days before roads and bridges were built. But the Cailleach does not only act as destroyer. On the contrary: some attribute to her the creation of the whole of the Hebrides! There are lots of anecdotes about landscape creation, both deliberate and accidental. The Cailleach is said to walk about carrying stones in a basket or a creel occasionally dropping them, thus creating mountains and groups of islands such as the Garvellachs. A wonderful bawdy story features the giant Cailleach wading through the sea, apron full of rocks, near the Ayrshire coast when a French sailor moves his boat underneath her. As the storyteller quaintly puts it, “he tickles her where you would expect a Frenchman to tickle a woman” — she shrieks and drops one of her rocks (the Frenchman has a lucky escape!) which we now know as Ailsa Craig. Loch Awe came into being when the Cailleach of Cruachan failed to cover the well on Ben Cruachan in time, and the water gushed out down into the valley, flooding villages and drowning people. She was devastated and she turned to stone, became the boulder that can still be seenon top of the mountain. You can visit Cruachan Power Station near Oban and enjoy a tour into the mountain — the story is part of it! So, as you have seen, there is more to the Cailleach than her winter goddess aspect. You may have felt her presence on a cold January night — I have, and I’m sure she dropped those big snowflakes on my nose to nudge me into getting back to my research! — but don’t just look for her there… find her in Scotland’s mountains, by the lochs, in pastures and meadows, and in the forests… for she is in all of them, a mistress of the land. All ancient wisdom and philosophies. his role in late summer. 3rd degree in almost as many months! As an Order, we're adapting more and more of RDNAs traditions (with our own little tweaks of course) every year, and our online course is reflective of that. So in August, we changed the name of the course to Reformed Druidism 101, which is much more acurate. The current session has 14 survivors, and 4 have already joined the Order (2 were members going in). Sadly, a few who did not survive simply refused to pay their obligation. Honor can be so lacking in the Pagan community. Our next online ordinations will be held in the mithrilstar chat room sometime around Yule. There are (as of this writing) 21 Druids eligible for the First Degree, 3 eligible for Second and 1 eligible for 4th. Today is Samhain / Calen Gaeaf, or November 1, 2004 CE. It is the 1st day of the 43rd Year of the Reform, the 1st day of the Season of Geimredh, and the 1st day of the Month of MÌ na Samhna. FULL MOONS occur on 26 Geimredh, 56 Geimredh, and 86 Geimredh. NEW MOONS occur on 12 Geimredh, 41 Geimredh and 71 Geimredh. The birthday of our Co-Founder, Sybok Pendderwydd, occurs on 15 Geimredh. Yule / Alban Arthuan, or the Winter Solistice occurs on 51 Geimredh. (a Saturday - Dydd Sadwrn -- Day of the Sequoia). The Sun enters Aquarius on 80 Geimred. While wassailing is now usually associated with Yule, it originated around Samhain. It was usually done by a group of individuals who had imbibed too much Samhain ale. They would gather stones or weapons and cider and go out to find the largest apple tree around. There, they throw the stones (or fire their weapons) into the branches of the apple tree to frighten away evil faeries. They would then drink to the tree's health and sustenance. Today, "wassailing" means the drinking to the health of anyone with a spiced punch or cider. 1. Bring the water and cream to a slow boil and remove from heat. 2. Beat the egg whites well. 3. Thoroughly mix in all the remaining ingredients except the alcohol. Allow this mixture to cool slightly, enough so that the heat from it will not crack your punch bowl. If you have a non-glass container for your wassail, you can skip the cooling process. 4. Blend in the alcohol just before serving, and be sure to offer the traditional toast to the old apple tree.